Larry R. Miller has been a freelance writer, worldwide health and fitness information source since 1982. Scientific studies suggest that sea buckthorn (SBT) supplementation may be able to improve every user’s life for the better. My personal experience with SBT has shown that its effects on skin health and skin condition is almost immediate. I’ve had a deep line in my left cheek for years, deep enough to catch my fingernails in if I slid them across that area. Our skin can be like a leather glove that has dried out from lack of lubricants and exposure to daily life. After 30 days of daily application using the formula I detailed in my Headlight article on 05-10-13, the line is almost invisible and can’t be felt with my fingernails. The difference between an old glove and our health is: when we give our body, our skin in this instance, the proper nutrition and care, our body has the ability to repair itself. Scientific evidence indicates that SBT may not only have healing qualities related to the skin, but also for cancer prevention and treatment, prevention of macular degeneration (gradual loss of eyesight), chronic inflammation and other maladies. Inflammation can be good and bad. The immune system uses inflammation as a tool to fight bacteria, viruses, other foreign invaders, muscle, ligament and tendon problems and a variety of other injuries. But, chronic inflammation breaks down the body and can cause a myriad of health problems. Scientists have definitely identified qualities in SBT when used as a supplement or herbal remedy that can be used in treating and preventing chronic inflammation. In order to understand the benefits of sea buckthorn, we have to understand what causes inflammation? CRP, or C-reactive protein, is produced by the liver. The level of CRP in your body is a benchmark indicator of the amount of inflammation you’re dealing with. What causes CRP to increase? Muscle inflammation caused by injury, trauma, damage to your body’s cellular makeup or any number of things. In the healing and beneficial scenario, inflammation surrounds the injury with healing fluid and interacts with autoimmune system to heal your body. Inflammation is part of your body’s magnificent natural healing system. Unfortunately many of us suffer from chronic inflammation. What are mast cells and what do they do? Though not the same, mast cells are similar in appearance and function to white blood cells. Mast cells are involved in wound healing and defense against pathogens. Mast cells are produced in your bone marrow and used by the body in the event of an injury or problem. Mast cells release chemicals that start the healing process; including chemicals that trigger inflammation. Mast cells, inflammation, your mucous membranes, ligaments and other connective tissue all function interdependently, synergistically. 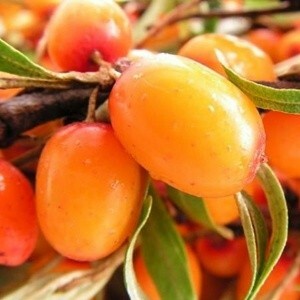 Sea buckthorn has been proven to benefit skin health, the mucous membranes and inflammation. Sea buckthorn contains a variety of nutrients, flavonoids, essential fatty acids, carotene, omega 3, 6, 7, 8 and 9, high percentages of vitamins C and E and antioxidants. Vitamins C, E (particularly tocotrienol E which I’ll cover in a future article) and carotenoids are all known inflammation fighters. Sea buckthorn fights inflammation by combining CRP, mast cells and a full spectrum of nutrients that help fight chronic inflammation and promote overall well being.